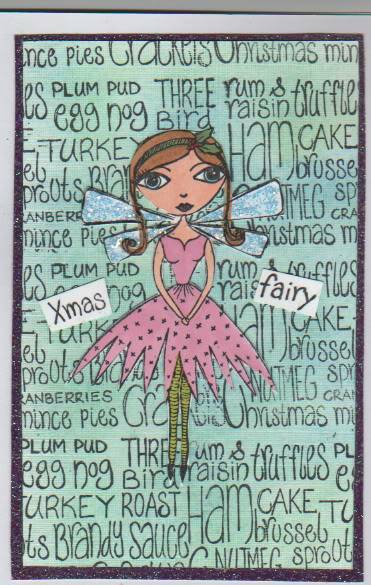 I have just received this lovely card from Cynthia (Mistyrat) in the huge crate of mail awaiting me. Thank you Cynthia. That's cute. I like the backing paper. Thanks Cynthia. Very 'on trend' love those tights. Glad it arrived safe. It should have reached you before you left for France as it was sent early enough. I like the background, too, but think it might be a stamp? Like the glittery wings. Thankyou, Cynthia. Thanks Cynthia. As Karelyn say very on trend. Thanks Cynthia. Love that paper/background. Very you.. Yes the background is a stamp.